Bismarck, Mandan, and Lincoln are home to about 100,000 people. Every one of those 100,000 has a reason why they choose to live here. Some were born and raised here, some moved away and came back, and some are transplants from other parts of the country or even world. Each person has a unique story about why they chose to stay here. One thing all 100,000 of us have in common is that we live, work, and play in this small town, growing city. Originally from Walla Walla, Washington, small town in the southeastern part of the state, best known for its sweet onions & award winning wineries. 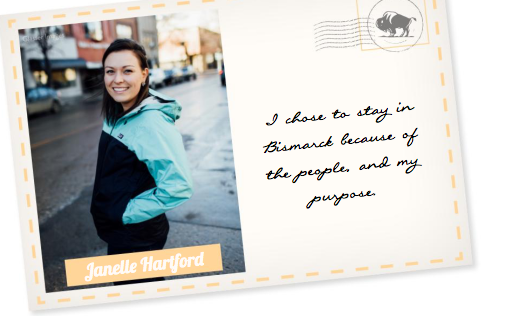 Janelle moved to North Dakota at the age of 18 when she decided to go to the University of Mary. After finishing school in 3 years she realized she wasn't ready to leave Bismarck. "The University gave me a sense of community and the north dakotan hospitality. I chose to stay in Bismarck because of the people, and my purpose. Place attachment is crucial to our well-being. I had to develop a brand new social network, and it means more to me because I built it from scratch." John Bollinger was born in St. Louis Missouri and attended Missouri State University. His wife Marcie, grew up in a small town called Chilton, Wisconsin. The two met in a bar Kalamazoo, Michigan and they were brought here to Bismarck all thanks to Northwoods Baseball League. John is the managing partner and general manager the beloved Bismarck Larks, Marcie is the producer and anchor for the nightly news on KFYR. John and Marcie are truly the power couple of Bismarck. "This city has such pride for Bismarck. It's a part of the culture. Bismarck is a type of Utopia. Everyone is so excited to live here and be apart of the community. We came at this great time of revitalization where everyone is investing in the community and helping bring it forward." Although they were skeptical of the weather at first, they came, they saw, and they stayed and they absolutely love it here. Nick Schwieters was born and raised here in Bismarck, at the age of 18 moved away for college and over the next few years would eventually find himself back in North Dakota to finish his college degree at NDSU. His wife Amanda, is originally from Zealand, ND (population of about 80.) Amanda studied at MSUM and graduated with a degree in mass communications. Nick and Amanda got married in June of 2014, Nick is the area director for N2 Publishing and produces two neighborhood publications; Life On The Horizon and Missouri Bay Living. Amanda is currently working for MSA United Way as the marketing manager. 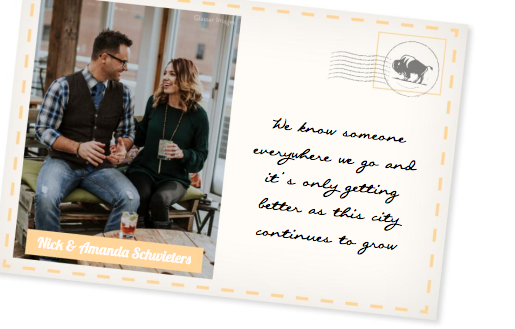 They chose to move back to Bismarck for many reasons, but one of their main reasons was that there was plenty of opportunity, great community and connections. Matt Schanandore grew up in Mandan, ND. He was always very involved in community events and one of his first jobs was as a tour guide for the Fort Abraham Lincoln State Park, where his passion for history and the community grew. He started his college career at North Dakota State University but, was drawn back to Bismarck in his second year of school where he would finish his undergrad and graduate degrees at the University of Mary. "The legendary history of the area drove my desire to stay in Mandan connecting the state and local community to the world." Some of Matt's favorite places in Mandan are the Historic Mandan Train Depot and Dykshoorn Park. These areas are known for hosting summertime events that have been happening for decades. Matt said, "Now, with a family of my own, I'm just as excited to take my kids to experience these legendary traditions." Kenny Howard was born and raised in Mandan, ND. He finished his college degree in Minneapolis, Minnesota where he would also meet his wife Kendra. They moved to San Francisco and lived there for seven years, it wasn't until after having their first child that they realized they wanted to be closer to family and landed themselves back in Mandan. A few years after moving back to North Dakota they made the decision to open Fireflour Pizza in the fall of 2012. Shortly after they opened the coffee side of the restaurant. Fast forward to today, they have some incredibly new and exciting news!! The space that was once known as One World Boutique will now known for delicious italian baked goods, meats, and pizzas. It will be named "Anima Cucina" which translates to "soul kitchen." The restaurant will also feature and coffee and wine bar and they hope to have a private party space/wine cellar within a year of opening. 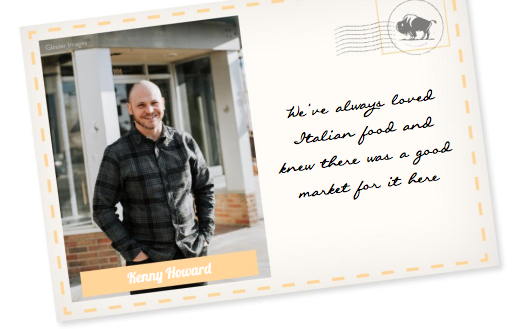 The Howard's are a big part of the downtown area and are continuing to help our city and community grow with love, happiness, food, and coffee... does it really get any better than that? We sure don't think so!